Dr. Eric Green co-authored and co-edited this new book. 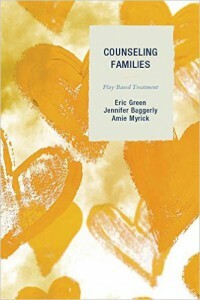 Renowned play therapist Dr. Eric Green has co-authored and co-edited the pictured new book on family counseling. This book is officially published in October 2015 by one of the finest academic houses anywhere, Rowman & Littlefield (publishers, for example, of the former Jason Aronson program). Dr. Green is on the esteemed AMHF professional advisory board. We urge followers of the AMHF Web site and News to be the first to review this new title on Amazon, Goodreads, and generally help spread the word. Note: Dr. Green’s much-in-demand Webinars are available on the AMHF homepage for free viewing and/or for 2-hours’ CEU—the latter by signing up here on The American Mental Health Foundation homepage. The directors of AMHF join me in congratulating Dr. Green, of Purdue University, on another outstanding achievement.